Step 1 Turn on a food processor fitted with the steel blade and drop in the garlic. When it is chopped and adhering to the sides of the bowl, stop the machine and scrape down the sides. Add the olives, capers and thyme and pulse until finely chopped. Scrape down the sides of the bowl. Step 2 Add the lemon juice, olive oil and mustard and process until the mixture is smooth. Stop the machine and scrape down the sides of the bowl. Step 3Add the tuna and pulse until well combined with the olive puree. Do not process too much or the texture will be overly pasty. Step 4Transfer to a bowl or serving dish. Refrigerate if not serving right away. In Recipes-list.com we have selected the most viewed recipes from category - Appetizers . Enjoy the best recipes specially selected for you! 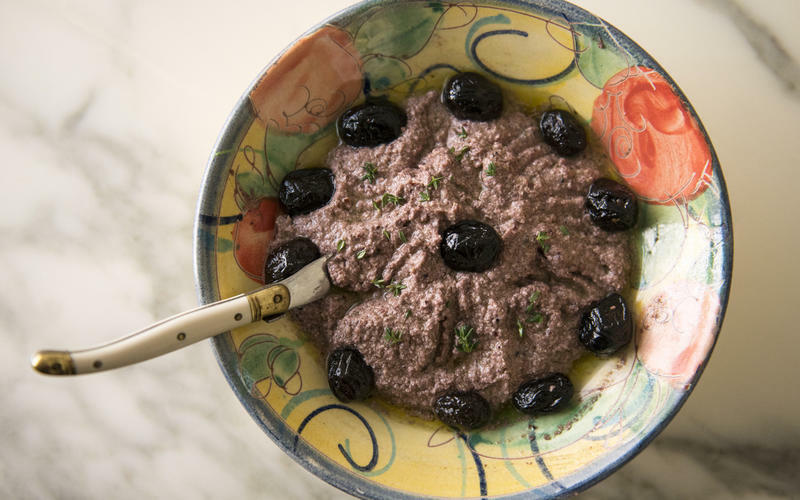 Kalamata and oil-cured olive tapenade with tuna is the right choice that will satisfy all your claims.